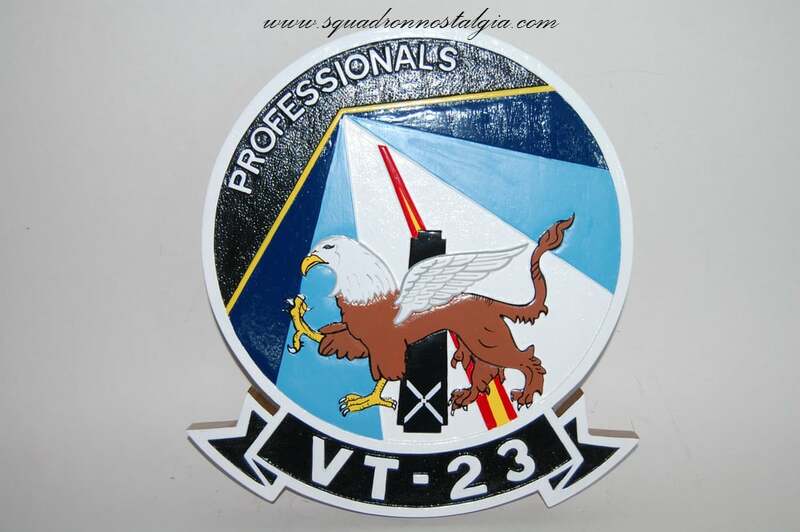 A carved 14 inch plaque of the VT-23 Profressionals – a perfect piece for the goat locker. 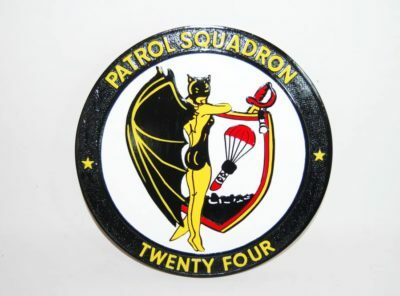 Proudly nicknamed “The Professionals,” Training Squadron TWENTY -THREE (VT-23) was originally commissioned in November 1958 as Advanced Training Unit (ATU) 222 at NAS Kingsville, Texas. 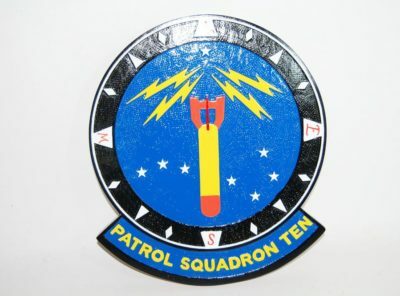 The first squadron in the Naval Air Training Command to employ supersonic aircraft, ATU-222 instructed selected student pilots in advanced air-to-air gunnery in the Grumman F-11A “Tiger.” ATU-222 completed its first year of operations accident free and was awarded the Chief of Naval Operations Safety Award for 1959. 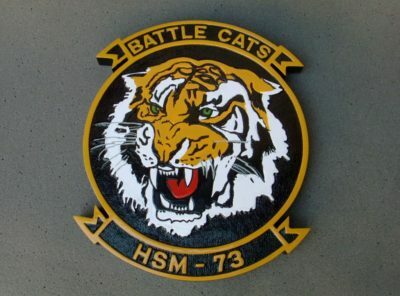 The squadron was redesignated VT-23 in May 1960, and transitioned to the F-9F “Cougar” in 1965. In May 1969, VT-23 set an advanced training command record by flying 1,318.8 hours in a single week. In 1970, the squadron again changed aircraft type – this time to McDonnell Douglas’ TA-4J “Skyhawk.” The TA-4J is the jet trainer version of the versatile light attack aircraft, which played a key role in United States’ air strikes in Southeast Asia. Receiving a new mission of intermediate strike training in October 1972, VT-23 transitioned the T-2C “Buckeye” jet trainer. 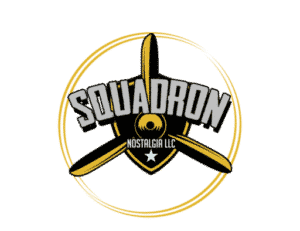 On July 7, 1994, the squadron moved to its current home – NAS Meridian. In October 1997, the squadron again changed aircraft type, this time to The Boeing Company T-45C “Goshawk.” Students are expected to begin training in this modern glass cockpit trainer during the summer of 1998. 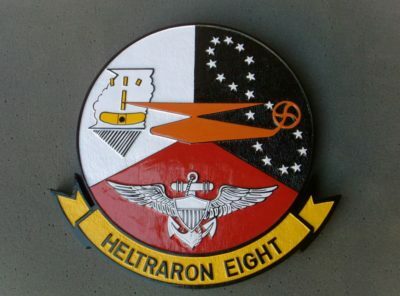 The command’s outstanding performance as a training squadron has earned it many awards. In fiscal years 1967 and 1980, VT-23 was named the “Top Jet Squadron” in the Naval Air Training Command. 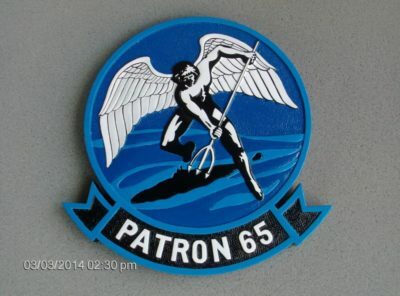 “The Professionals” were also awarded the prestigious Vice Admiral Goldthwaite Award as the Navy’s top training squadron in 1973, 1987 and 1995. VT-23 won the Chief of Naval Air Training Award for Training Excellence in 1979, 1984, 1986 and 1988 and the Chief of Naval Operations Safety Award in 1981, 1982, 1983, 1986, 1987, 1988 and 1993. 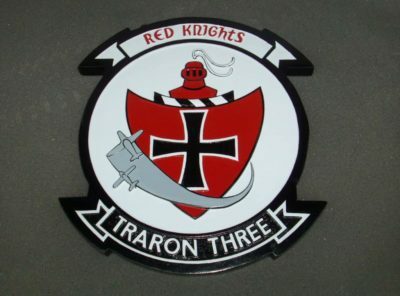 In 1988, “The Professionals” recorded the largest single production year of an intermediate training squadron in over a decade, producing 33 students over its goal. In recognition, VT-23 was awarded its second Meritorious Unit Commendation for exceptional training effectiveness, safety achievement and operations records. In 1989, the command was presented the Admiral John H. Towers Safety Award for achieving the most outstanding mission-oriented safety record in the Naval Air Training Command.